This tour will take you to see the wonders of invaluable architectural and historical value that encloses the colonial center of Quito. 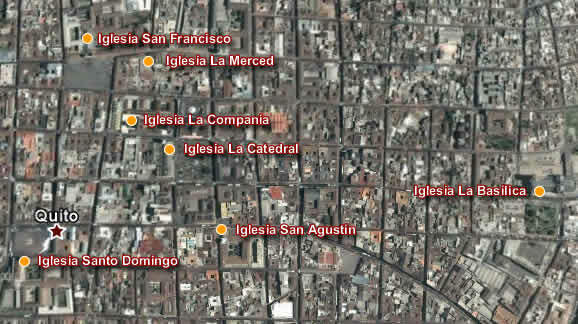 Enjoy an interesting tour of the churches, plazas and museums that are part of the old city. In the afternoon our guide will pick you up at the hotel, to start our visit to the Mirador de Guápulo, considered one of the two major viewpoints of the city. From there observe the colorful colonial houses and churches lit dazzle us with its sober beauty. Also enjoy a spectacular view Cumbayá Valley and the eastern mountain range. We continue through the magnificent cobblestone streets toward the old town, enjoy a spectacular show touring the romantic plazas and impressive public and religious buildings. The unique lighting creates a unique atmosphere which makes it especially Baroque architecture that goes unnoticed during the day. You will be able to see the extraordinary conservation of all the colonial buildings in the center of the city. For this reason, Quito was declared Cultural Heritage by UNESCO in 1978. Visit the Plaza de la Independencia, an interesting hike know the Church of the Cathedral, Government Palace and Archbishop, the Church of the Company where you can appreciate its adornments and gold altars, the tabernacle and the church of San Francisco, largest and one of the oldest churches in the city, built in 1535. We continue our visit to the Mirador del Panecillo a place renowned for its beauty where we can observe not only the city but also the snowy peak of volcanoes surrounding it. Located 3000mts. above the sea, is a landmark for the city because it marks the division between the south and center of Quito and still holds the legacy of the Inca. Warm clothes, gloves, camera, binoculars and good walking shoes.